Check out this instant win game by Lindsay Olives. Just visit the contest page here, fill out some info, and play the game. ONE (1) GRAND PRIZE: $2,500 cash; and one (1) of each of the prize packs listed in the Instant Win Game Prizes section. Approximate Retail Value ("ARV"): $2,690.50. TWENTY FIVE (25) FIRST PRIZES: A Good Cook Italian Themed Prize Pack, including: One (1) Good Cook Heavy Plastic 11” Colander, One (1) Good Cook 8 Quart Stock Pot With Lid, One (1) Good Cook Parmesan Cheese Grater, One (1) Good Cook Spaghetti Server Tool. ARV: $52.36. TWENTY FIVE (25) SECOND PRIZES: A Good Cook Pizza Themed Prize Pack, including: One (1) Good Cook 13” Non-Stick Crisp Crust Pizza Pan, One (1) Good Cook 15” Pizza Stand, One (1) Good Cook Pizza Cutter, One (1) Good Cook 11.75” Non-Stick Pizza Pan. ARV: $51.76. TWENTY FIVE (25) THIRD PRIZES: A Good Cook Mexican Themed Prize Pack, including: One (1) Good Cook Large Plastic Salsa Dish, One (1) Good Cook 10” Sauté Pan, One (1) Good Cook 7 Quart Plastic Bowl, One (1) Good Cook Tortilla Warmer. ARV: $48.36. TWENTY FIVE (25) FOURTH PRIZES: A Good Cook Party Themed Prize Pack, including: One (1) Good Cook 7 Quart Plastic Bowl, One (1) package of Good Cook Jumbo Straws, 50ct., One (1) package of Good Cook Frilled Party Picks, 72ct, One (1) Good Cook Wing Deluxe Italian Corkscrew. ARV: $22.06. 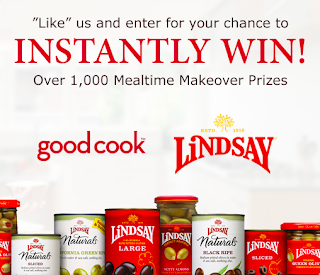 ONE THOUSAND (1,000) FIFTH PRIZES: A coupon for one (1) free Lindsay® Product. ARV: $3.99. Limit: One (1) Instant Win Game prize per person.